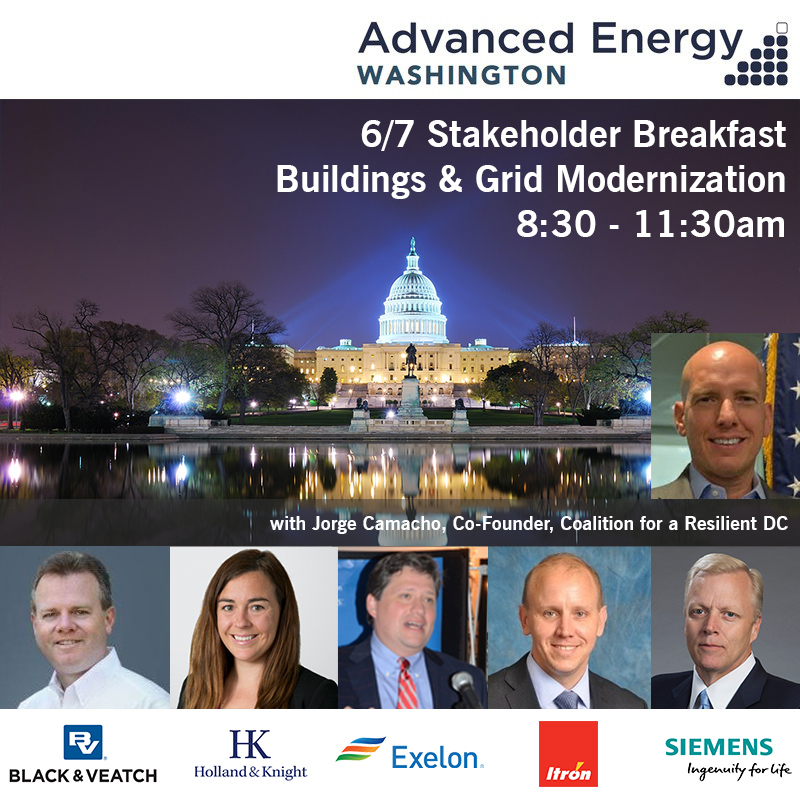 The Washington Advanced Energy (WAE) Q2 Stakeholder Breakfast started with a call to urgency, HG Chissell - Founder and CEO of AEG - emphasized the importance of finding grid modernization solutions that were meaningful, effective, and would truly address the challenges facing D.C.’s energy sector in the long run. It was a fitting way to begin a meeting of energy experts and problem solvers gathered to discuss how the District’s building stock and electricity infrastructure can be updated to create a "3D" Grid: decarbonized, distributed, and digitalized. HG’s intro was followed by a series of presentations by practitioners and stakeholders closely involved in grid modernization efforts in D.C. and elsewhere. First, Dave Hulinsky, Director of Utility Automation and Telecom at Black & Veatch, gave an overview of the problem of grid modernization nationally. According to Hulinsky, the average age of distribution infrastructure in the U.S. is 60 years, and this segment of the power sector is expected to attract $500 billion in investment over the next 15 years. This is a significant opportunity to modernize the distribution grid, and Black & Veatch has been adjusting its focus to take advantage of this opportunity. This sentiment was echoed by Michael Carlson, President of Siemens Digital Grid, North America. Carlson emphasized that anyone working “in the trenches” in the utility industry could tell you how quickly things were changing. The grid is developing towards a model that is decarbonized, decentralized, and digitalized. This change, from Michael’s viewpoint, is inevitable; the only question is whether utilities will be proactive or reactive in their response to it. The main challenge going forward is determining what business models will succeed in this new world. In the following presentation, Johan Ulloa, Manager for Regional Energy Efficiency Sales at Constellation, identified smart buildings as drivers of value in the grid of the future. Investments in building controls and automations, which have short payback periods due to the improved energy efficiency they create, could be used to defray the cost of traditional grid investments like transformers that by nature don’t have a payback period. Johan believed the future would belong to “blended energy projects,” where investments in traditional generation and renewable energy technologies would be combined with technologies like demand-side management and smart inverters to create wholistic improvements in our nation’s infrastructure. Chris Laskowski, Legislative Director for DC Councilmember Allen Ward, spoke next, bringing the discussion back to local issues through his introduction of DC’s proposed DER Authority. The aim of this new agency is to accelerate a transition to the modernized grid that Carlson previously described by promoting the use of DERs in place of traditional grid assets. Each time DC’s utility, Pepco, proposes an investment of $25 million or more, the DER Authority would launch a parallel RFP process to see if DER companies and other infrastructure solution providers could meet Pepco’s needs for less money. The goal, Laskowski emphasized, was to ensure that as technology costs improved, DC was taking advantage of these improvements to reduce costs for ratepayers. Finally, Jorge Camacho, co-founder of the Coalition for a Resilient DC, went into more detail about the DER Authority, which his organization had originally proposed to Councilmember Ward. Camacho emphasized that this was not an anti-utility bill but instead was designed to create new revenue streams for Pepco, which would be able to participate in the Authority’s RFPs as well. The DER Authority is designed to ensure grid planning happens in a collaborative environment where the utility and other providers can jointly offer solutions. After the presentations, a handful of attendees in the audience provided their thoughts on the subjects discussed. One of these was Rob Stewart, Manager of Smart Grid and Technology at Pepco. Stewart briefly introduced the efforts that Pepco had been making towards grid modernization, including new pilot projects with DERs, electric vehicles, and energy storage. Stewart also pointed out that Pepco is the only utility in the country that is conducting hosting capacity analysis to determine where and how many DERs can be accommodated in Pepco’s service territory. Although Stewart expressed concern that the DER Authority may end up being a costly duplication of Pepco’s own efforts, others disagreed; H.G. cited the Brooklyn-Queens Demand Management project in New York as an example of an independent investigation into DER-based infrastructure solutions reducing system costs for ratepayers. Chairman Betty Anne Kane of the DC Public Service Commission (PSC) also offered her perspective, introducing DC’s Modernizing the Energy Delivery System for Increased Stability (MEDSIS) initiative that has become the centerpiece of the District’s grid modernization efforts. Thus far, the PSC has used MEDSIS to investigate new solutions to infrastructure upgrades that may have been missed in past utility analyses – solutions that are similar to the types that the DER Authority is designed to promote. In MEDSIS’ next phase, the PSC plans to engage stakeholders in working groups to investigate contemporary grid issues like net metering, energy storage, and non-wire alternatives to traditional grid investments. In the second half of the event, the WAE Stakeholder Breakfast transitioned into small group discussions. The breakfast attendees, all of whom were seated at small tables of six, took 45 minutes to identify what they believed were the key steps to creating a power grid that achieves the three D’s: decarbonization, decentralization, and digitalization. By identifying the next best steps from a pool of experienced and engaged energy stakeholders, AEG has provided Washington grid planners with valuable insights to take into consideration.